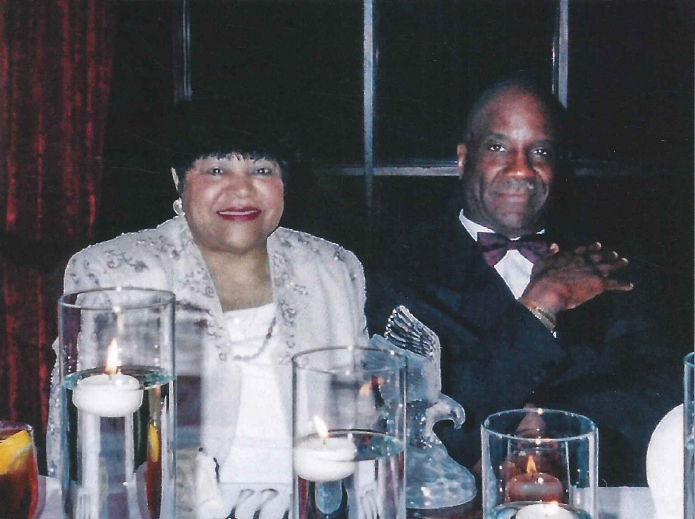 Earnest Reese with wife of 47 years, Artelia, at his retirement banquet. PREVIOUS JOBS AT THE AJC: Like a lot of the old-timers (of which few are left), I once worked the desk as well as covered sports on the high school, collegiate and professional level. WHEN DID YOU START AT THE AJC? I first applied for a job at the AJC in 1965. Nine years later, in the summer of '74, I was hired as a part-timer in the sports department. I landed a full-time position in January of '75. There is something to be said for perseverance. WHAT DID YOU DO BEFORE COMING TO THE AJC? After arriving in the Atlanta area following residency in Denver, I worked in the Henry County Public School System as a teacher and a coach (football, basketball and baseball) for nine years. During that time, I also wrote for the Atlanta Voice and, on occasion, contributed articles to the local weekly. WHAT ARE SOME OF THE BIGGEST DIFFERENCES IN THE AJC TODAY VS. WHEN YOU STARTED? When I started work here, ''typewriter,'' which is probably a term that does not exist in the vocabulary of many youngsters growing up in this age of computer dominance, was the instrument of mass communication. As workers on the desk, we scribbled headlines on sheets of paper. Today, seemingly everything is driven by the computer, and nothing gets done without its influence. MOST MEMORABLE MOMENT IN THE OFFICE: Before we committed totally to college beat writers, I had gone to the University of Georgia to cover a football practice and conduct enough interviews to write two stories during that week. I left the practice before its conclusion in order to file a story for the first edition. When I entered the office the next morning, an overzealous editor met me and, with all of my co-workers watching and listening, began to dress me down for not reporting vital details regarding an injury sustained by a star Bulldog on the tail end of practice the evening before. I listened patiently while steaming. "We can't tolerate this kind of shoddy reporting," I was told. "You need to do a better job of checking out your facts." Turned out that, under my byline, someone had inserted information about the injury, but did not go into any specifics. My response to him was, "I didn't write anything about an injury. You need to do a better job of checking out your 'bleeping' facts." MOST MEMORABLE IN THE FIELD: The year before the late Bear Bryant stepped down as football coach at Alabama, the Crimson Tide in the preseason of '81 had been picked No. 1 in several polls, but had gotten off to a rocky 2-1 start. In search of an explanation for the three-point loss to Georgia Tech in Birmingham and the shaky nine-point victory over Kentucky the next week, I interviewed seven players and one assistant coach before heading to Bryant's office. I was invited in by Bryant. I told him I needed about two minutes of his time. He began talking. He told recruiting stories - stories of sitting down and breaking bread with the families of players he desperately wanted in the Tide's fold. He spoke of games that had impacted his career. An hour after the interview started, I thanked him for his time. To this day, I regret not having a tape recorder that day. FAVORITE COLLEAGUE: The late Al Smith, who in stressful times would always lighten the moment with ''you've gotta love it,'' was one of my favorites. Throughout his career with the AJC, Al was steady, dependable, good under pressure. It seemed he was also unappreciated. But no matter the treatment he received as a person drawing and redrawing the lines for the sports pages, Al was always a professional who cared deeply about the daily product. FAVORITE SPORT TO COVER: That would be football, a game I played in high school and college before coaching and officiating it. Having seen the game through the eyes of a player, a coach, an official and the brother and father of former Division I players, I feel I know the sport and the emotions linked to it as well as any. HOW WILL YOU SPEND YOUR RETIREMENT? I enjoy working with kids, so I probably will have some involvement with youth programs in my community. I also enjoy fishing, bowling, working in the yard, and playing with the dogs and horses. All of the aforementioned will be outlets - to be engaged in at my leisure. I also intend to write the book that for the longest time has existed deep in my thoughts. It will have absolutely nothing to do with sports. I grew up in Mississippi during the '40s and '50s. Clinically speaking, my experiences were rich, and richly deserving of a literary effort on my part. It likely will be titled "The Pain That Won't Subside."